18 years old. For customers under age 18 years old it is necessary to have father or guardians approval. The rented vehicle must be driven exclusively by the customer and it is not to be given to another person. The customer must expressly declare to be personally responsible of the actions, omissions of whoever guides the vehicle, except if it depends on illegal facts that can not be avoided by the Costumer. Ours vehicles are delivered in good conditions and working order, without apparent or hidden defects, any exceptions to this are noted at the back of the contract. The customer is required to return the vehicle in exactly the same conditions as delivered. Eco-Rent may not deliver reserved vehicles in case of theft, damages or o non return. Obligatory with conventional Credit Card (“electron” type is not accepted) the deposit will be detained by ECO-RENT if the vehicle returned results to be damaged. The customer will be responsible for any damages caused to the rented vehicle as well as theft during the period. In these cases the responsibility of the customer will be equivalent to the amount of the sucurity deposit. In cases where the damage, theft and/or the fire is caused by willful misconduct, improper use, gross negligence or negligence of the customer, the same will be held responsible to compensate ECO-RENT for the full amount of damage, without limitation. An additional days hire charge will incur for all vehicles returned over an hour late. If you know you are not going to be able to get back by the agreed time, please call ECO RENT informing and asking for further authorisation. Customer that use credit card accept that the cost of rent and any eventual extra expenses agreed will be withdrawn from their account. In the event of cancelled forward booking, customer authorises ECO-RENT to debit their credit card, 30 days before rental date the 30% deposit paid will be held back; 30 to 15 days before 50% of total amount; 15 to 7 days before 70% of total amount and 6 to 1 day before the total amount of rental cost. Bookings are to be cancelled by email, fax or SMS (mobile text message). In the case of contrasting interpretations of the two versions of this letter, the Italian one will prevail over all other languages. Includes passengers and property, with a maximum of: for bikes € 258.300,00 and € 5.164.568,99 for Scooter and Minibus, unless the damage is caused by negligence or improper use of the vehicle. The customer will be responsible and he must to refund ECO-RENT for: a) the period necessary to repair the damaged vehicle, for which the customer is liable; b) reimbursement costs for collect or transportation of a damaged vehicle the wreckers and/or for the repair of the same vehicle; c) or injury to the driver and for damages to objects and luggage transported in the vehicle. In case of damages that have not been caused by the customer, he can take another vehicle or be refunded for the unused period. If requested we can offer extra services like bikes guided tours (road or MTB) and self guided tours for bike or Vespa. is not responsable of physical malaise caused by the use of the rented vehicle or or physical damages caused by accidents or falls on and/or off road. Valid Drivers licence, issued from at least one year is required and qualified for driving the type of rented vehicle. The vehicle must not be driven under the influence of drink or drugs or in a psychological state that the customer cannot comply with the rules of the road, nor is it to be used for any illegal purpose, for competitions in speed (racing) or rented to another party. 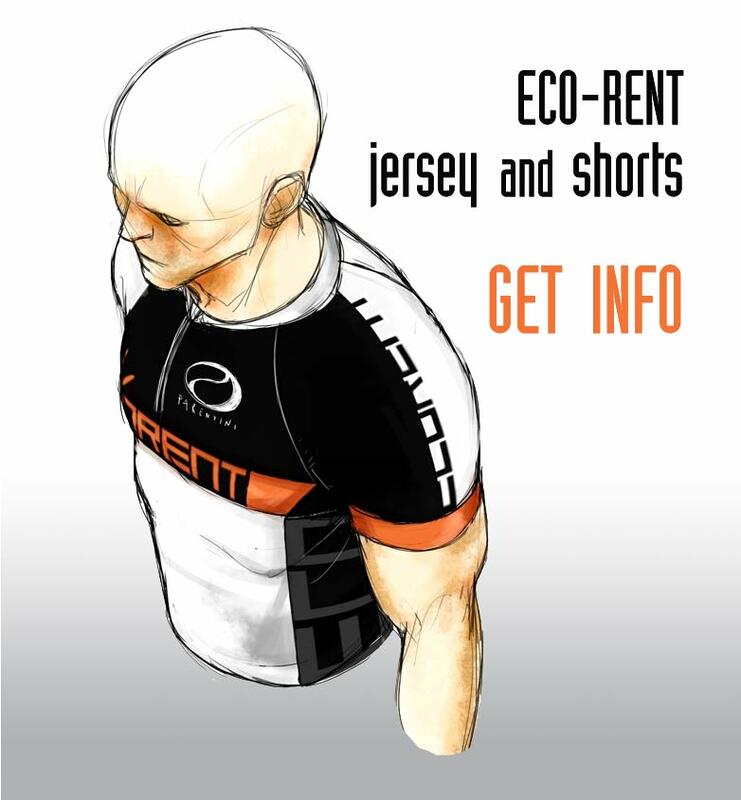 If the customer wishes to use the vehicle outside of Italy this can only be done with ECO RENT’s written approval. In case of accident the customer must inform ECO-RENT within 24 hours and must have a list of damages compiled by a competent authority. In case of brake down please contact ECO RENT, it is forbidden to an unauthorised company undertake repair work. The loss of documents or plate are not covered by insurance, therefore the customre will be charged € 400,00 will be charged in addition to the rental cost. For the loss of keys the customer will be charged up to €150.00 plus the expenses to recover the vehicle. € 12,00 will be charged in addiction of the cost of used fuel, for vehicles returned without the same quantity of fuel when rental starts. We will not refund fuel wich has been paid but not used. The customer agrees to inform la ECO-RENT of any fines whatsoever that have been incurred during the rental period and, if paid, must supply proof of payment to. The customer commit oneself to pay the amount due for any fine received and to refund the Lessor any costs that the latter has borne, plus € 20,00 for each fine. Minimum age 21, maximum 70, issued from at least one year is required. Prices for rent exposed in our chart are to be considered for the pick up and delivery in our location in Cascina. - the home delivery service is provided with a rent expense of € 120 (based on the vehicle and duration of the rent) and will be effected from 9 to 12 a.m. and from 3 to 7 p.m. For deliveries after time an additional charge of € 30 will be considered per delivery. - up to 55 km. € 32,00 per vehicle. Note: at the time of the booking we need to know the height (and weight for the hire of full suspension bikes) of the client to choose the correct size of the bike. We will equip the bikes with: cyclocomputer, helmet, lock, repair kit, pump, Eco-Rent water bottle. Extra charge: SPD pedals €/day 3,00, spd shoes €/day 3,50. The deducible at the client’s charge cannot be entirely eliminated (35% off) but it can be reduced by the payment of the T.P. as shown in the table below; Non applicabile a biciclette e MTB. The deducible at the client’s charge (for damages caused by negligence of the client) cannot be entirely eliminated (35% off), but it can be reduced by the payment of the C.D.W. as shown in the table below.